Scarlett apartment is made for the travelers who are used to only the best. This superbly decorated super modern apartment has masculine flair with its charcoal grey color scheme with whimsical red accents. Separate living room has modern sofa that can be used for additional sleeping and is decorated with magnificent wall-size mural of Odessa. Bathroom has large Jacuzzi bath and private washing machine. 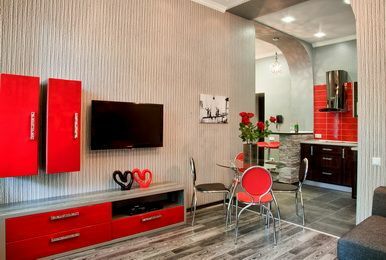 The whole space of Scarlett apartment, with its fully equipped modern kitchen, TV with Satellite channels and wireless internet, is perfectly designed for a short or much longer stay and would make a superb corporate suite for one of many foreign business representatives that are working in Odessa. Whether you are staying in Odessa for a day or for a few years, Scarlett apartment offers everything you might need, including a wonderful little balcony overlooking the City Garden and the ancient linden trees of the famous and trendy Deribasovskaya street. The apartment is located in the very heart of Odessa and just a short stroll from the apartment will bring you to one of many Odessa’s bars and restaurants, or to the magnificent Spaso-Preobrazhensky Cathedral and Cathedral Square.